Modern manufacturing environments are incredibly complex entities, with sophisticated machinery that pushes materials to their limits. Limiting downtime and reducing service intervals is absolutely critical for the modern production plant, as missed deadlines often have reverberations throughout entire supply chains. One pertinent issue in manufacturing is corrosion. Hot, acidic production lines can be seen across a huge variety of industries, from automated food production to manual vehicle assembly lines. These conditions are extremely tough on light alloys, which, due to their low cost and beneficial strength-to-weight ratios, are becoming increasingly used. 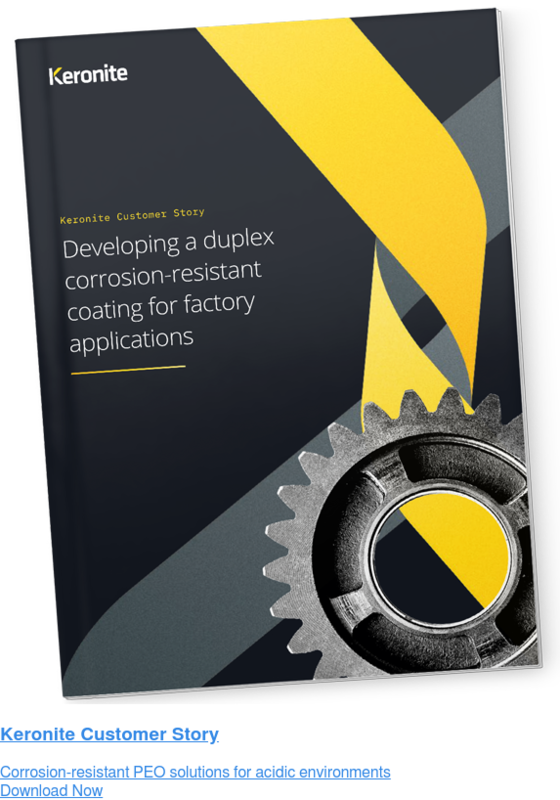 A leading manufacturer of factory installation products approached Keronite seeking to increase the life of their corrosion-prone components. Their main objective was to elongate the life of their products, helping to reduce unanticipated service intervals and keeping workers safer. Keronite's scientists took up the baton. Using plasma electrolytic oxidation (PEO), they were able to create a duplex coating extending life by thousands of hours. To read the full story, click below.